Chronic pain, depression, and fatigue are common effects resulting from the cancer experience; new interventions are needed. This study examined the effect of Reimagine, an online symptom self-management curriculum that teaches coping skills, on key outcomes. 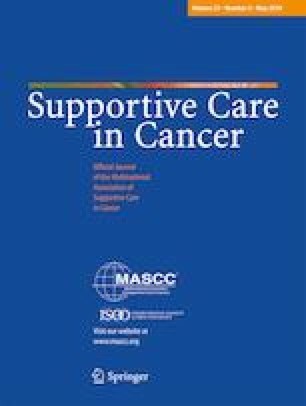 Adult breast cancer survivors with chronic pain were recruited from the Army of Women volunteer registry for this randomized controlled trial and randomized 1:1 to Reimagine or usual care conditions. Electronic surveys collected demographic, clinical, and outcome data at baseline and 18 weeks post-intervention. Participants (N = 89) were mean age 56.7 ± 8.7 years; 67% married; 58% employed; mean years since diagnosis 8.2 ± 6.6; and 89% were in remission or cured of their breast cancer. There was a significant difference in the change in depression scores for treatment (M = − 1.7, SD = 4.5) and usual care (M = 0.3, SD = 3.8) conditions; t(85) = − 2.3, p = .03. Difference in the change in fatigue scores was significant for treatment (M = 4.8, SD = 9.0) and usual care (M = 1.2, SD = 6.6) conditions; t(87) = 2.2, p = .03. Most Reimagine users (94%) would recommend the curriculum to others. These results suggest that Reimagine has an effect on depression and fatigue symptoms for breast cancer survivors. Online programs can be a feasible and effective alternative to in-person support. Additional research is recommended with larger and more diverse samples. Depression and fatigue are common effects resulting from the breast cancer experience. Results indicate that an online symptom self-management curriculum, Reimagine, has an effect on these key outcomes, but future research with larger and more diverse samples is needed. The online version of this article ( https://doi.org/10.1007/s00520-018-4431-7) contains supplementary material, which is available to authorized users. The authors wish to thank the breast cancer survivors who participated in this study. Recruitment was facilitated by the Dr. Susan Love Research Foundation. Sophia Smith: Conceptualization, funding acquisition, software, project administration, data analysis, and writing—original draft, and writing—review and editing. Kristin MacDermott: Conceptualization, funding acquisition, software, and writing—review and editing. Wei Pan: Data analysis and writing—review and editing. Sathya Amarasekara: Data analysis and writing—review and editing. Marilyn Hockenberry: writing—review and editing. Trial (NCT02465892) was funded by Pfizer Independent Grants for Learning & Change (#16218019). All authors received support from money paid to Duke University as part of the Pfizer Independent Grants for Learning and Change award. The authors whose names are listed immediately below certify that they have NO affiliations with or involvement in any organization or entity with any financial interest (such as honoraria; educational grants; participation in speakers’ bureaus; membership, employment, consultancies, stock ownership, or other equity interest; and expert testimony or patent-licensing arrangements), or non-financial interest (such as personal or professional relationships, affiliations, knowledge or beliefs) in the subject matter or materials discussed in this manuscript. Ms. Kristin MacDermott, LMFT reports the following details of affiliation or involvement in an organization or entity with a financial or non-financial interest in the subject matter or materials discussed in this manuscript: Board membership and Employment by Pillars4Life, Inc.